Accidents happen, and with these tips, they can be distant memories instead of constant reminders! When your cat urinates outside of the litter box, removing the stain and odor can be difficult. To make matters worse, the longer the odor remains the more likely either that cat or others will reoffend in that area. For this reason it is incredibly important to make fast work of any urine odors and stains, and here's how! 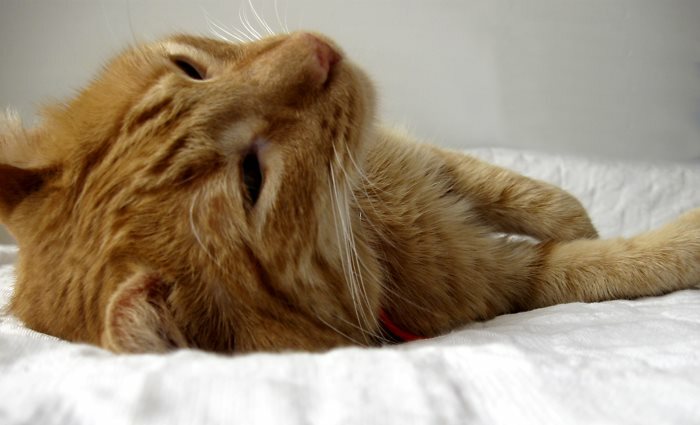 Why is cat urine so difficult to clean and deodorize? Call it a product of evolution, cat urine odors are actually intended to last a long time, allowing a cat to mark its territory. While this is perfectly fine outside, inside your home is another story entirely! The unique smell and persistence of cat urine can be attributed to a combination of fatty acids, a pheromone protein known as felinine, and alkaline salts that develop as the urine dries. This is a rather stinky cocktail that actually creates an odor that can worsen over time! Before we get into tips for removing cat urine odor, it's important to discuss the importance of pretesting. In order to protect the carpet, cushion, flooring, etc., it is always recommended to test any cleaning product in an inconspicuous area first to ensure that it will not cause any damage or discoloration to the material. This is particularly true of pet stain removers, as some are much more aggressive than others. If you recognize any difference in the appearance of your pretested area, it is recommended to look into other products that may work better for your needs. Did you just catch your cat in the act? Is the area still wet? If so, an enzyme based cleaner will likely work best to remove the stain and odor as enzyme based cleaners will break down the acids in the urine at the molecular level. This results in a neutralization of the odor causing compounds right at the source! If you still notice an odor after treatment, an additional application may be necessary. If the stain is dry or your cats have reoffended in the same area, vinegar based cleaners will likely work best for addressing the stain and odor. While an acid itself, vinegar will neutralize the alkaline salts that form when cat urine dries, ultimately eliminating the odor. Though vinegar does itself have a strong odor, this dissipates relatively quickly and will take the cat urine odor with it. This is particularly useful for stains on hardwood floors and is generally mixed 1 part vinegar to 1 part water. Removing cat urine stains and odors from carpeting can be difficult as it can penetrate deep into the fibers. For this reason, multiple applications will most likely be required. • Make sure that you first blot up as much urine as possible. • Spray the area liberally with your chosen cleaning product. Enzyme based cleaners will work better for this, as they will break down the acids at the molecular level. • Wait 15 to 20 minutes to allow the product to work. • Blot up as much of the enzyme cleaner as possible. Depending on how long the cats have been urinating in the area, refinishing of the hardwood may be necessary, however proper cleaning should neutralize the odor and may lighten staining. • Make sure that you first mop up as much urine as possible. Do not use products containing ammonia, as this can actually set the stain making neutralization and removal more difficult. • Spray the area liberally with your chosen cleaning product. Vinegar based cleaners often work better for this, as they are better able to penetrate into the wood and will break down the alkaline salts formed as cat urine dries. • Wait 15 to 20 minutes to allow the solution to work. • Clean the surface being careful not to use ammonia based cleaners. Removing cat urine from furniture is much like removing it from carpet. One benefit that you may have depending on where the cat urinated is that you may be able to get to the stain from both sides (Such as with seat cushions). Wherever possible, you may wish to remove the seat cushion cover, allowing you to also apply an enzymatic or vinegar based cleaner to the cushion as well as the back of the cover. • If possible, unzip the cover and remove the cushion. • Give the stain a good rinse under cold running water in the sink to remove as much residual urine as possible. • Place the clothing in the washing machine with detergent and either 1 cup of baking soda or ¼ cup of apple cider vinegar. The washing machine should be set on a cold setting, as warm temperatures can set the stain. Also, when choosing a detergent, make sure that your preferred laundry detergent does not contain ammonia, as this will also set the stain. • Check the clothing to see if you notice any remaining odor before placing the item in the dryer, as this will set the stain. If you notice any remaining odor, spray the stain with an enzyme based cleaner and rewash. We hope that you found this information helpful! Accidents happen, and with these tips, they can be distant memories instead of constant reminders! As always, if we can ever be of any service to you, please do not hesitate to Contact Our Offices! We're happy to help!